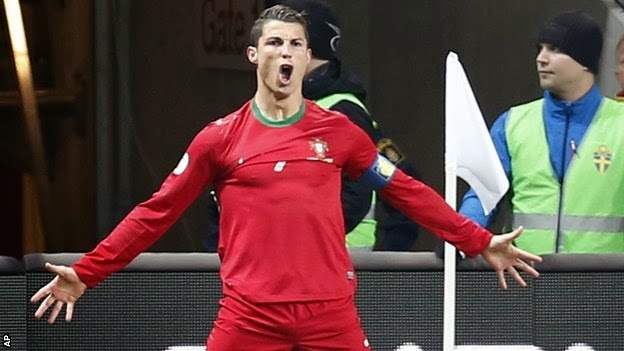 C Ronaldo has won his personal duel with Sweden's Zlatan Ibrahimovic to help Portugal reach the 2014 World Cup. C Ronaldo, scored his fifth hat-trick of the season in the play-off second leg as Portugal won 3-2 in Solna - despite Ibrahimovic's double - to secure a 4-2 aggregate victory. C Ronaldo also struck the only goal in the first leg, with those four efforts in the tie prompting a host of former and current players to suggest the ex-Manchester United forward should win this year's Ballon d'Or, which is awarded to the best player in the world. His latest performance could help his chances of winning the award because Fifa, world football's governing body, extended the voting period from 15 November to 29 November after receiving a response of less that 50% from eligible voters.